The Penthouse self catering apartment combines style and contemporary design, in a classic Victorian terrace, with stunning sea views in an elevated position over Plymouth Hoe. The Penthouse is a highly exclusive luxury apartment on the waterfront, with spectacular panoramic sea views from the Devon countryside, across the Plymouth Sound and Drakes Island, over the Tamar and to the beautiful Cornwall scenery and National Trust estate of Mount Edgcumbe. The self-catering "New York" style apartment faces south and has a Loft style lounge with high-beamed ceilings and dual aspect windows, allowing the sea view to enter the apartment. The apartment has been converted, furnished and decorated to the highest possible standard in a modern contemporary design. A modern designer kitchen, luxury bathroom and entertainment systems have tastefully been installed. The rear of the apartment boasts a Northerly city view. With a significant amount of windows and contrasting views, it makes this apartment truly feel open, light and airy. The Penthouse is located in a famous historical Victorian terrace overlooking Plymouth Hoe waterfront and is centrally located in PL1 on the Hoe, close to all attractions and facilities. Plymouth Hoe is a central hub and location for events throughout the year, including the National Fireworks Championship, sporting events, rallies, fairs, charity events and Guy Fawkes' Night. Large Loft style lounge with high-beamed ceilings and breathtaking sea views. 42" Plasma Freeview HD TV, DVD, surround sound and stereo. Stylish dining area to sit 4 people. 1 exceptional master bedroom with king size double bed, and TV. 1 spacious bedroom with double bed. A luxury contemporary bathroom with wet room, high quality fixtures and fittings. Prime location on the Hoe, sea view and close to all of Plymouth's major attractions. 5 minute walk into the city centre and Plymouth's famous Barbican. 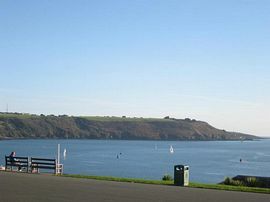 luxury self-catering accommodation and apartments with spectacular sea views in the historic city of Plymouth. Our apartments are in beautiful period Victorian buildings, converted, decorated and furnished to the highest possible standards with style and elegance. Local Services: Luxury Sea Views apartments overlook the magnificent seafront, located centrally in PL1 with easy access to the city's attractions and facilities. It is just a short walk to the historic Barbican or city centre, or you can stroll along the seafront or Hoe directly in front of the apartments. Plymouth is a waterfront city on the border of Devon and Cornwall, with an outstanding natural harbour and various estuaries including the River Tamar. The city has a long and fascinating history from Sir Francis Drake, the sailing of the Mayflower to Scott of the Antarctic. The full beauty of the breathtaking sea views across Plymouth Sound and the Tamar can be enjoyed from our apartments. Plymouth has excellent facilities including good restaurants, pubs, clubs, health spas, concert halls, theatres, boat tours, the National Marine Aquarium, art galleries, the new Drake circus shopping centre, sailing, diving, water sports, international ferry and airport. The Penthouse is located on The Hoe in plymouth city centre overlooking the victorian sea front. Located in PL1. Prices from £390.00 - £850.00 per week. "Very stylish apartment with great sea views" "Fantastic apartment, much better than what we anticipated. The view of plymouth sound and the harbour are stunning"